When a movie’s title names its central character based on a specific incident, it’s usually a reflection of the catalytic event that sparks the story and, by the end of the movie, might even prove to be irrelevant. In the case of “The Breakup Girl,” its protagonist, Claire (Shannon Woodward) gets hit with the devastating and completely unforeseen end of her relationship and must deal with the subsequent overwhelming attention from her family as the 29-year-old tries to get her life together. The announcement from her father that he has cancer can’t come at a worse time, as this breakup girl tries to cope and graduate to being identified as something more than a work-in-progress. Woodward is an actress who showed great promise in her role as the daughter of two con artists on FX’s short-lived “The Riches,” and then stuck around “Raising Hope” for the duration of its run as an intelligent but unmotivated love interest. Her role here is much more akin to the latter part, as Claire stresses over turning twenty-nine and not having accomplished anything she has hoped for, something which her two sisters, Sharon (Wendi McLendon-Covey) and Kendra (India Menuez), and overbearing mother Joan (Mary Kay Place) remind her of constantly. Only her father (Ray Wise) seems happy to see her where she is, though his aloof attitude, which defines his outlook on his illness, makes it clear that she is her father’s son, unable to take like as seriously as it sometimes needs to be taken. The sisters here are all remarkably different. Claire is stuck in place, not having done much and not set to do much in the future. Kendra’s career is just starting out, and though her theatric interests aren’t to everyone’s tastes, she is young and aspiring enough to get away with it. Sharon has achieved considerable success and worries about such things as what modification to make next on her house while her husband Steve (Joe Lo Truglio) yearns to make an emotional connection with his distant wife. These characters anchor a story that’s mildly engaging and interesting. Woodward is a fine lead, and it would be great to see her get parts like this again in the future. Place and Wise are well-cast, and Truglio, who is usually used for exaggerated comic relief, shines in a role that doesn’t necessarily even ask as much of him as he gives. Timm Sharp, who was a major player on HBO’s “Enlightened,” has a small part that could have used more screen time and development. 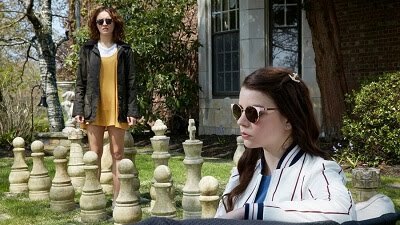 This movie as a whole is a moderately inviting look at a short snippet of one young woman’s life that might well be worthwhile but never quite catches fire and sparks the way its title suggests it could.